With an iron fist, the Great Library controls the knowledge of the world, ruthlessly stamping out all rebellion and, in the name of the greater good, forbidding the personal ownership of books. Jess Brightwell has survived his introduction to the sinister, seductive world of the Library, but serving in its army is nothing like he envisioned. His life and the lives of those he cares for have been altered forever. His best friend is lost, and Morgan, the girl he loves, is locked away in the Iron Tower, doomed to a life apart from everything she knows. After embarking on a mission to save one of their own, Jess and his band of allies make one wrong move and suddenly find themselves hunted by the Library’s deadly automata and forced to flee Alexandria, all the way to London. FORMAT: Paper and Fire is the second novel in The Great Library Series. In order to best enjoy it, it is essential to read Ink and Bone first. Paper and Fire is a YA fantasy/alternative historical fiction/dystopia/steampunk novel. It stands at 357 pages and was published July 5, 2016 by New American Library. ANALYSIS: Rachel Caine's book Ink and Bone was another huge favorite of mine. It was a novel that had a very Harry Potter-ish feel to it, but it still had a unique feel. Everything from the concept and loveable character, to the world building was captivating. 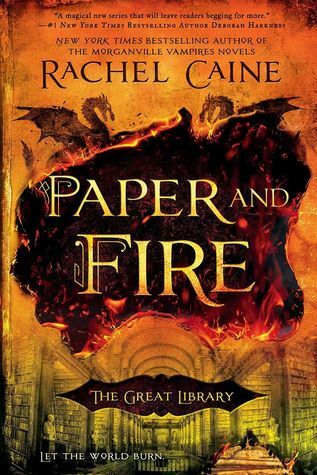 I was so in love with the book that I honestly could not wait for the second book, Paper and Fire to come out. Considering how high my expectations were, the immediate question you should ask yourself is "Does Paper and Fire live up to the hype and expectations placed on it from the first book?". My answer would be "Sort of". Paper and Fire is the ultimate definition of a middle book. The first novel, Ink and Bone, was so unique and surprising that it was a pure delight to read. It made readers want to love it. Paper and Fire, while a wonderful novel, doesn't have that sparkle and shine that comes with a first book in a series. The biggest issue with Paper and Fire is its plot progression and speed. There is a lot of action going on during Paper and Fire. The characters are arranging rescue missions, running from enemies, and trying to stay ahead of The Library. Unfortunately, there is this feel of too much action. The characters are always running around doing something or exploring a new place or looking for some clue. While this might seem like plot progression, there is very stagnant feel to the book. It is almost like all the characters did was run around and not a whole lot was accomplished. In fact, I ended the book and my first thought was 'We didn't really get much done'. The entire second book is basically one giant rescue mission. There are some tidbits here and there that further a character's development or progress the plot a little, but not enough. It really had a feel of a lot of running around and not a lot of progression. I will say the last few chapters opened up a whole new possibility for the next book and a lot happened in the end, but there were still a lot of missed opportunities throughout the book. Let's just say that there is a cliffhanger at the end and it will definitely leave fans of the series waiting in anticipation for book three. Even though it was a rushed book and basically one giant rescue mission, it doesn't mean the book was bad. It just didn't have the appeal the first book did. There are still a lot of things I loved about the book – the idea of who controls what when it comes to knowledge and books, the whole portrayal that reading physical books is better than a screen on a tablet, and the whole idea that using technology to store information could result in some very important information being wiped away if the higher ups don't agree with it. Overall, Paper and Fire was a fun read. It didn't have the wowing power the first book did in the series, but it wasn't bad. There is a lot to look forward to with this series and I honestly cannot wait until book three. This one looks so good, I am going to see if the kids would like it. They are reading Silencing Sharks by John Hope,I think it's a great book! My boys love it! johnhopewriting.com is his site. I recommend him.